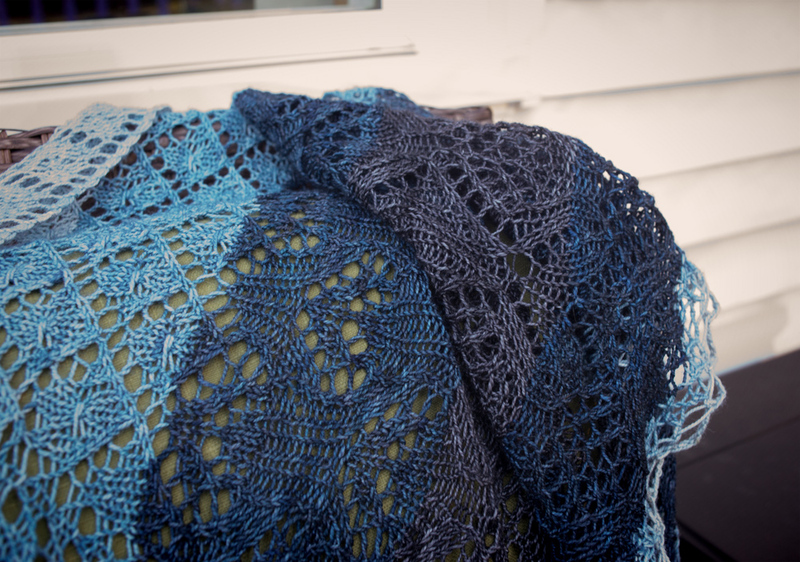 I finally got my act together and took photos of my finished Algiers Shawl to show you. Here it is in all of those glorious blues. The yarn kit that I got from Woolen Rabbit isn’t exactly a gradient and I played around a bit with the colors, going from light to dark and then back out to light again. I felt like such a rebel doing it that way. Let’s get in a little closer and look at those blues. I honestly can’t decide which stripe is my favorite, I just love them all. And look at all of those yarn overs. Lots and lots of yarn overs. How about if we get even a little closer. I want to make sure you see that beautiful stitch pattern. I truly enjoyed knitting this shawl. The pattern is easy to follow, as are all of Kirsten’s, and the design is simple and beautiful. 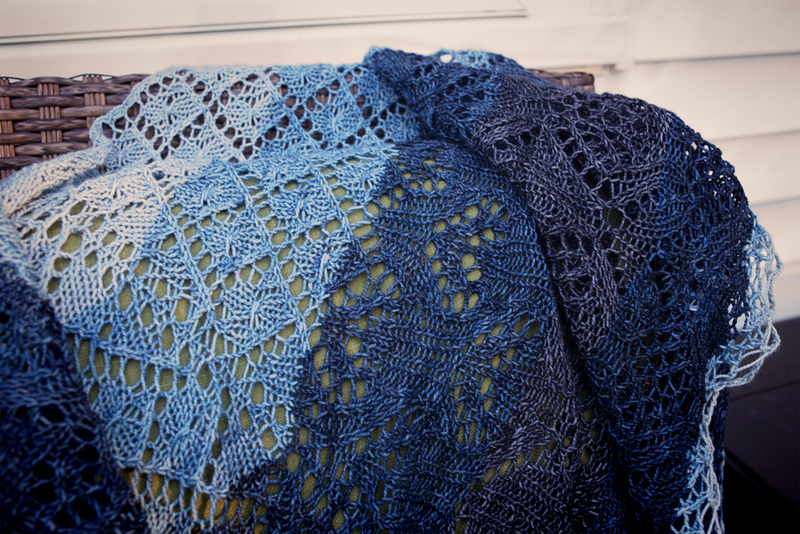 That crochet bind off took a bit of time – that’s a lot of loops – but it was totally worth it. And one last look of the whole piece. 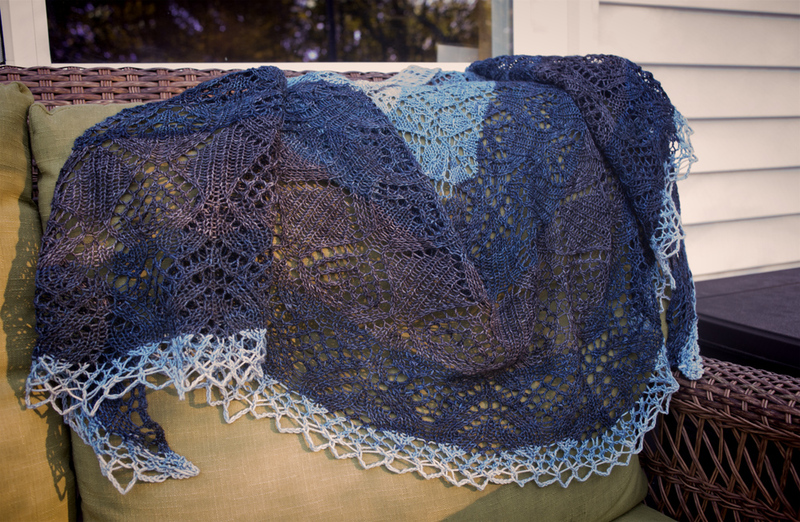 It’s been quite a while since I finished a shawl like this and I’m so excited to have it for the fall. In fact, I’ve already worn it and it’s warm and soft and lovely and goes with jeans and a blouse perfectly. Sure, it took me all summer (and then some) to knit the thing but it’s done and ready just in time for cooler temps, outside fires, apple picking and more. It’s gorgeous! Can’t wait to see it in person. Geez that’s nice! I like youe design choices! it’s beautiful, Carole! Algiers is still one of my favorite lace shawls – lacey, but not fussy. I’d love to see you wearing it with jeans and a blouse. that would be a very pretty picture! 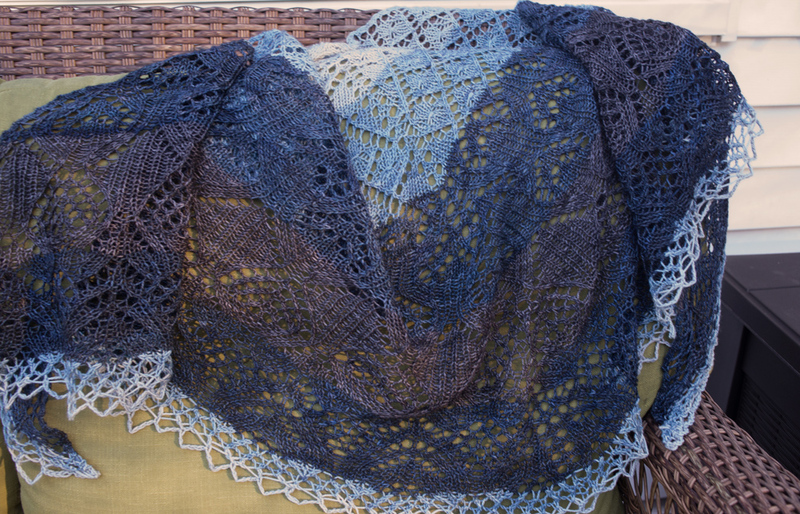 All those yarnovers, bind-off loops, and careful blocking certainly resulted in a lovely shawl, perfect for fall! Lovely! The combination of colors is great. And I think we’d like to see a modeled shot! I think it’s lovely! The colors really look nice together, and I think it looks like something you could wear with just about anything. Oh my gosh – your shawl is so beautiful! And the colors are perfect. That will be wonderful when you need to wrap up a bit on the deck. Enjoy!! That’s really beautiful, and lovely work on your part. I have a gradient kit put aside, and the pattern printed out. Guess I’ve been hesitating because it was a mystery knit once-upon-a-time. You’ve inspired me to move it up the list. 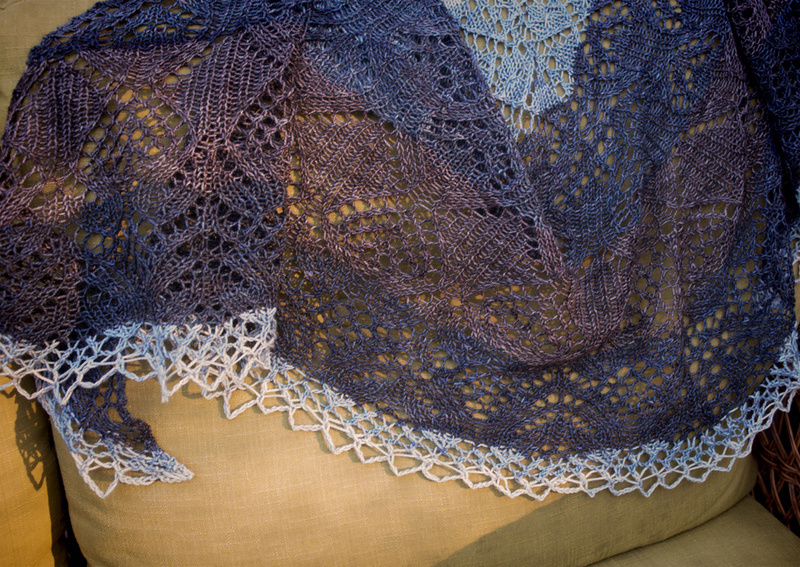 Beautiful yarn, well-honed skill and lots of patience have come together in a perfect result. Kim’s colors really turned out beautifully in that shawl! You did an exceptional job in the blocking.